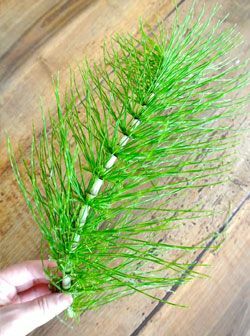 Today I would like to talk to you about horsetail ( Equisetum arvense ), one of those plants fallen into oblivion in modern times, obscured by chemistry and official medicine, despite having a millenarian history full of therapeutic successes behind it. And as always to pay the costs are the patients, who are systematically directed by the "Official Medicine" to the use of synthetic drugs, overflowing with contraindications, when, in many circumstances, these people could use the horsetail, or of other safe and also extremely effective natural remedies. Called also "Coda cavallina" due to its resemblance to the tail of a horse, the horsetail is a perennial herbaceous plant without leaves or flowers, about 30-60 cm in height. It is common throughout the Peninsula, it grows up to 2500 m in humid, siliceous and clayey places, along the banks of streams, in fields, in woods and on slopes. From the creeping, black rhizome two completely different stems develop, which are differentiated into sterile stems and fertile stems. Only the latter are used in phytotherapy. In folk medicine this plant has always been an excellent remedy for anemia , for people with osteoporosis, or nails and brittle hair , for hypertensive , for the treatment of numerous disorders of the kidneys and bladder .... and much more yet. Moreover, recent studies have shown that one of its main constituents, that is organic silicon , is extremely valuable also for the fight against even more serious pathologies, such as tuberculosis and even cancer . On tuberculosis we can say that there are already a good deal of testimonies from patients treated with this plant.Testimonies reported in numerous texts on natural medicine (for example: " Health from the Pharmacy of the Lord" by Maria Treben, "Natural Medicine for everyone" by Manuel Lezaeta "," Phytotherapy, healing with plants "by Dr. Jean Valnet, etc. ). On the effects of organic silicon on tumor pathologies we are still in its infancy and we can not expose ourselves too much to hazardous conclusions. There are those who, like Maria Treben swears to have already seen many people recover thanks to this plant, so much so that in its texts always recommends to drink 2-3 teas of horsetail to those who have bad luck to be suffering from a tumor. Sweating of the feet . The sterile stem (whole plant) is used for the equation . Here we find the following active ingredients : silicon (from 6% to 10%), calcium, potassium, magnesium, iron, manganese, tannins, bitter principles, glucosides, linoleic acid, linolenic acid, oleic acid, stearic acid, equisetin, phytosterol, etorosides, flavonoids, saponosides and vitamin C.
Horsetail finds applications both for internal use, taken in the form of powder or herbal tea, and for external use, with sitz baths, steam packs, foot baths, clutches, etc. Its healing properties make it an extremely versatile plant that can be used for the treatment and prevention of numerous disorders. Below you will find a "short" list. Horsetail, in addition to containing iron, enjoys haemopoietic properties, whichpromotes the formation of red blood cells . For this reason it is recommended to take herbal tea in cases of anemia, asthenia and general weakness. Horsetail is the plant species with the highest concentration of organic silicon.Silicon stimulates calcium metabolism, promotes the formation of collagen, fortifies bone and connective tissues . Moreover, it seems that the flavonoids contained in the equisetum, in synergy with the silicon, determine an increase in the number of osteoblasts (the cells that build the new bone) and their more marked activity, while they would be able to reduce both the number and the osteoclast activity (bone-destroying cells). For this reason we recommend taking it as a powder, or herbal tea to prevent and treat cases of demineralization, fractures, decalcification, osteopenia and osteoporosis. Also due to its high silicon content and its strong remineralizing action, horsetail, horsetail taken as a powder or as an infusion, is indicated to people with easily flaking nails , or with problems of weak hair and alopecia . In addition, the herbal tea, used externally to wash the hair, strengthens them and counteracts the appearance of dandruff . Now forgotten, horsetail was once the elective medicine for the treatment of many diseases of the kidneys and bladder . In numerous texts praise the doctors and herbalists of the caliber of Sebastian Kneipp, Maria Treben and more recently the dott. Jean Valnet, French doctor and pioneer of herbal medicine and modern aromatherapy. 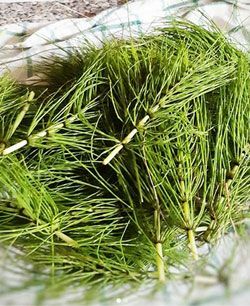 For the treatment of these disorders horsetail is excellent both as a tea to drink, and for the preparation of sitz baths (to learn more go to the chapter "How to use"). The fastest aid in the case of renella and kidney stones is ensured by horsetail sockets of horsetail; at the same time one to two cups of horsetail are drunk. In this way the kidneys and urination are stimulated. Try to keep the urine as much as possible.Urinating renella and kidney stones will then be excreted with great pressure. Thanks to its strong diuretic properties , the herbal tea is very useful for those suffering from water retention, swollen legs, cellulite, obesity and overweight . For those suffering from dropsy , a disorder characterized by excess fluid in serous cavities and in the subcutaneous tissue, Maria Treben recommends siping 5-6 cups of horsetail tea every day for six days in a row.Thanks to the diuretic action of this plant, the excess of liquids will be eliminated by the emission of abundant urine. Thanks to its well-known diuretic properties horsetail is a valid help also for those suffering from hypertension .Two or three cups a day of this tea is a safe and effective help to lower the arterisoa pressure. Note : horsetail is contraindicated to those who are already taking blood pressure medications. Horsetail is a powerful natural hemostatic, able to block bleeding . In case of internal bleeding (lungs, kidneys, stomach, uterus, bleeding hemorrhoids, etc.) and hemoptysis (blood vomiting) Maria Treben recommends taking it in the form of herbal tea, from 2 to 3 cups a day. Maria Treben, the parish priest Kneipp and the naturopath Manuel Lazaeta recommend its use externally with washes using the decoction, oo steam tablets (see the chapter "How to use"), to be applied on injuries, ulcers, sores and wounds. Externally used horsetail acts as a healing, cleans the wound and blocks the bleeding of blood. Thanks to its haemostatic action, horsetail can also be useful to stop bleeding gums and to promote the healing of mouth ulcers. Not surprisingly, it is an ingredient found in many toothpastes. The method of use is that of herbal tea. It prepares an infusion it is made to cool and it is used to make some rinses. Thanks to its diuretic action, the horsetail tea promotes the elimination of excess uric acids , thus helping to relieve rheumatism and gout pains. Maria Treben recommends one to two teas a day. In which case you suffer from it, horsetail can be useful to solve the problem of excessive sweating of the feet. In this case, Maria Treben, in addition to drinking from one to two cups a day of horsetail tea, recommends making pediluvi (see the chapter "How to use"). Herbal tea : Pour a teaspoon of dried horsetail (double if the plant is fresh) in a cup of boiling water, cover and leave to infuse for 10 minutes. Filter and drink. Sickbeans : soak 100g of Horsetail in 5 liters of cold water and leave to stand for 12 hours. Heat the macerate and filter it and add it to the bath water. The tank must contain enough water to dip the body up to the height of the kidneys. After a 20-minute bath, you get up without drying, wrap yourself in a bathrobe and lie down on the bed to sweat an hour. Pediluvi : Pour 5 teaspoons of dried horsetail in a liter of cold water and leave to rest for about 12 hours. Heat the macerate slightly, filter it and add it to the water in a basin. The duration of the foot bath must be 20 minutes. Steam poultice : in this case the fresh crop horsetail must be used. Put two large handfuls of horsetail in a sieve and hang it over a pot with boiling water. As soon as the horsetail is warm and soft, wrap it in a piece of linen and apply it to the affected area. Leave for several hours, or overnight. 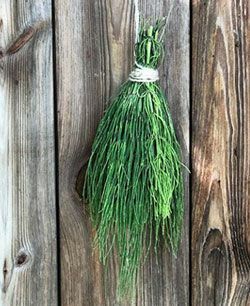 If you do not have fresh horsetail you can soak a cloth with herbal tea prepared from dried horsetail. The herbal tea and the extracts of horsetail (for internal use) are contraindicated during pregnancy and lactation, also it is not recommended for use in the case of administration of diuretic drugs and those who have hypersensitivity to one or more active ingredients present in the plant . Warning : there are many varieties of horsetail, some of which are toxic to humans (for example the Equisetum palustre). So, at least if you are not an expert in the field, I strongly advise against avoiding the collection of this plant. 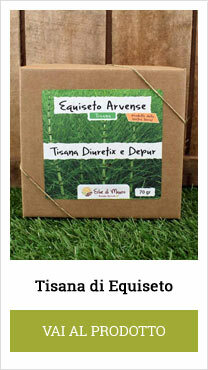 You can order dried horsetail ready for herbal teas (Equisetum arvense variety) directly on my website . 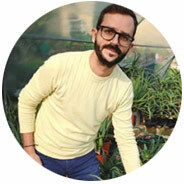 The plant is grown by my farm in the open countryside, in the hills of Fermo, in a natural way and far from polluted areas, such as landfills, highways or shopping centers.